stakes in the video marketer SpotXchange and the multichannel network StyleHaul. at Arvato. The downscaling of businesses in structural decline in part offset this growth. business. The EBITDA margin was again high at 14.2 percent (previous year: 14.3 percent). absence of special items which had boosted group profit the previous fiscal year. Thomas Rabe, Chairman and CEO of Bertelsmann, said: “2014 was a gratifying year for us. 40 percent of group revenues, businesses in structural decline about five percent. volume of about €500 million. and YouTube via their social media channels. catalogs Montana and Hal David. businesses, including digital marketplace Pepperfry and education provider iNurture. 31, 2014, partly due to higher provisions for pensions, after €4.22 billion in the previous year. Adjusted operating free cash flow amounted to €1.71 billion (previous year: €1.83 billion). year, they will receive profit participation amounting to €85 million. Hungary, where the national parliament had levied a new tax on advertising income. target corridor of 90 to 100 percent. down slightly at 38.9 percent (previous year: 40.9 percent). BMG, and film rights at RTL Group. 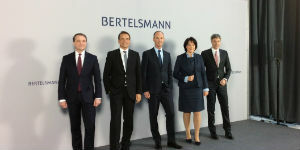 positions in Bertelsmann companies in Germany. 11,768 people at year-end (December 31, 2013: 11,491 employees). only partially compensated for by the acquisition of the “Best of TV” home shopping service. advertising market share and responded with a programming offensive. RTL Nederland was able to maintain its considerable lead. company increased its investment in the production of original web content. (previous year: 16.8 billion), reflecting strong growth. Online” by YouTube star Zoe Sugg, aka Zoella, was Britain’s fastest-selling debut novel ever. Wimpy Kid: The Long Haul” by Jeff Kinney. more than 100 million e-books worldwide. Gruner + Jahr changed its legal form to become a GmbH & Co. KG. publishers despite a decline in advertising and circulation revenues in a shrinking market. market position was expanded with a stake in the video marketer Advideum. the sale of shareholdings in Adria Media Zagreb in Croatia. prospects, by selling all of its shares in Networkplay Media, Seventynine and Maxposure. company grew its digital activities. In 2014, as in past years, numerous G+J journalists and authors won awards for their work. organically, increasing by a total of 6.2 percent to €4.7 billion (previous year: €4.4 billion). been organized into Solution Groups and by country. contract in the public sector. initially involved high set-up costs, which impacted earnings in this business segment. year’s level. Revenues in the North American market declined due to portfolio adjustments. and new customers were acquired. In China, Arvato’s development was almost stable. 4,108 people at year-end (December 31, 2013: 6,201 employees). product range toward offering small print runs, additional formats and shorter timelines. items are not included in operating EBITDA. declines from the scheduled downscaling of the club and direct-marketing business. School of Medicine in Puerto Rico and the innovative US startup Galvanize. Grammy and Echo Awards. At the beginning of 2014, BMG opened an office in Beijing. the multichannel network StyleHaul to RTL Group. Ukraine. The direct-sales organization Inmediaone was discontinued on June 30, 2014.